What’s On-Page SEO, how do you do it, and why do you even need to do it? It’s an important part of SEO, and without doing it, you will have a hard time ranking for any keyword! For a step-by-step walkthrough through all the steps you have to do for SEO for your Blog or website, check out our ebook The Step-by-Step Guide to SEO. Below is the full transcript of this episode of Marketing in Minutes. On-Page SEO: What is it, and how do you fix it? I talked about SEO quite a bit on this podcast. But one area I’ve been missing out on a bit was On-Page SEO. So what’s On-Page SEO, how does it fit into SEO in general, and what do you need to do to fix your On-Page SEO? I’m Jonathan Gebauer and today, let’s talk about On-Page SEO. I’ve dedicated several episodes of this podcast to SEO since I started. And they are continually the most listened to episodes. I talked about what SEO is and how it works, I talked about keywords, Link building, and other areas of SEO, and I gave you some quick win tactics to improve your SEO. The one area I didn’t talk about enough is On-Page SEO. The problem here is that On-Page SEO is one of the first things you need to do – or your results will never be as good as they should be. 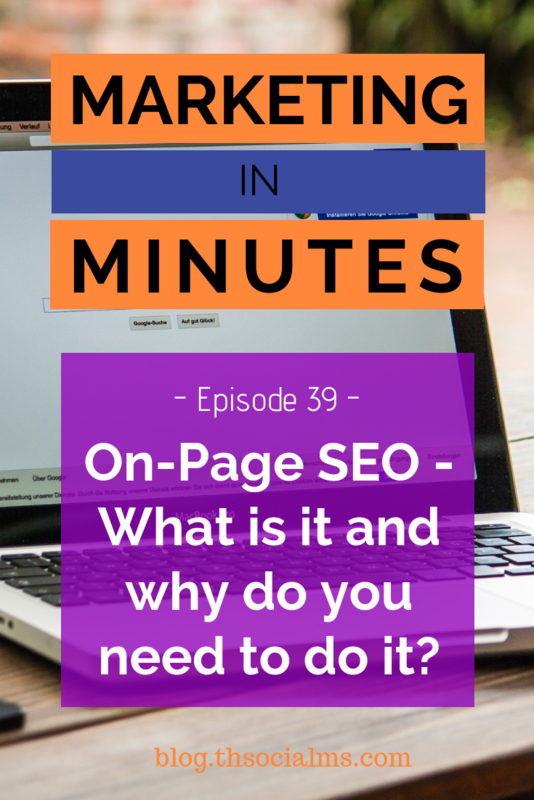 If you want to know more about the general concepts of SEO or Keywords and Links, listen to episodes 5 and 6 of this podcast… But today, let’s go into detail with On-Page SEO. On-Page SEO is about getting the technical aspects of your site right for SEO in general. Is your site easy to understand for Google and can it be easily indexed? Is your site fast enough to be ranked high? Are your URLs optimized for SEO? Does Google have problems with your site? The idea is that On-Page SEO deals with every SEO related task that you can fix by changing or improving your site setup. What you have to do for this is to go over these questions and fix any problems that you find. Some of these questions are related to ranking factors for Google – for instance page speed and whether your site is mobile ready. But the ones that are even more important are the ones that are about whether Google can actually understand your site. If that sounds like a lot of work to you, then you aren’t completely wrong. But the good thing is, that most of this work only needs to be done once. And once you’ve answered most of the questions and fixed the problems, then you only need to do some basic tasks regularly. Since you now understand what you want to achieve with on-Page SEO, let’s talk about what you need to do. It starts with tasks that you need to do once on every new site. If you’re working with WordPress, I’ve got a complete blog article that gives you a step-by-step walkthrough on how to do that – but for today it’s enough to understand the general concept. The first task is to make sure that your URLs are easy to read and understand by search engines. In wordpress, you switch your URLs to the setting called “Post Name” and you’re done. The second task is to make sure that your site is mobile ready – in WordPress you just have to make sure that your Theme is what is called responsive. The third task is to set-up SEO plugins and more importantly Google Search Console and for your website. This is a free tool by Google – and extremely important, as it shows you messages about SEO problems and in-depth SEO performance information. It also allows you to submit information like sitemaps to Google or to reindex parts of your site. In WordPress, you would install and set up the Yoast SEO plugin which will help you with a few of those steps – like transmitting a sitemap to Google. A fourth and final task for initial On-Page SEO is to ensure your site runs fast. You do that by installing various caching options on your site and server and by using a tool like GTMetrix to identify what makes your site run slow. There is a whole episode of this podcast that talks about page speed which I will link in the show notes. And that’s really all you need to do initially. If you do all of these tasks once, you have a site that is optimized as good as you can when you start. But the thing about SEO is, that it’s never something you only do initially. You also have to do some things again and again. Luckily, once you’ve gone through an initial setup, you don’t have to worry that much anymore. Here is what you should do once in a while for On-Page SEO. You should check search console once a week for errors and problems. Every couple of months, you should also check whether your site is still running fast using GTMetrix. You should also go over old posts and add links to other posts where it makes sense regularly. This is called internal linking and will improve your search rankings. And for even older posts, you should sometimes update them to indicate that they are up-to-date and Google should rank them higher. And that’s it – these were the main tasks of On-Page SEO. I hope you have a better understanding of how On-Page SEO works and why you need to know about it. The important thing is that you can’t skip this initial setup without paying a high price. It will either take a lot longer to rank high with your site, or you won’t be able to rank at all if you completely neglect your On-Page SEO. This was another episode of Marketing in Minutes and I hope you found it helpful – if you did, subscribe, share, and please leave a review on Apple podcasts. We really need your help there to reach a bigger audience! For more information about On-Page SEO, check out the show notes at blog.thesocialms.com/MiM-39 – that’s blog.thesocialms.com/MiM-39. And for more in-depth marketing tutorials and step-by-step guides, please check out some of our ebooks, which are linked in the show notes as well! I’m Jonathan Gebauer and this was Marketing in Minutes. That’s all, take care, bye!